Use of your email accounts and social media accounts are not safe on public computers. But, there may be some circumstances when we have to use our email accounts on a public computer or our friend’s computer. The worst condition is that when you reach home and then remember that you forgot to log out email account on that computer. If it were on a friend’s computer, we can trust him/her and ask him to log out. But what if you forgot to log out from your Gmail account on a public computer. Your Gmail account is a door to access your files on Google Drive, photos on Google Photos and many other things. One can also reset your accounts on other social networking sites. Your emails and chats on the risk, So what should you do to protect your emails? If you are using Gmail, then I can help you in this kind of situation. I have a simple but effective security tip from Gmail that lets you end that session remotely and log out of your Gmail account from that computer. Step 2: Now scroll down the page to the bottom and find the line which says, “Last account activity:”. Just next to this line you will also find time in minutes, hours or day. Step 3: Click on the link “Details” just below the above line. Note: In the above pic, I have painted my IP address for privacy reasons. Now it will log out all other active sessions being run on other computers. It also helps when you see that some activity is being shown from the location you never went. You can sign out your account from that location and change the password immediately. 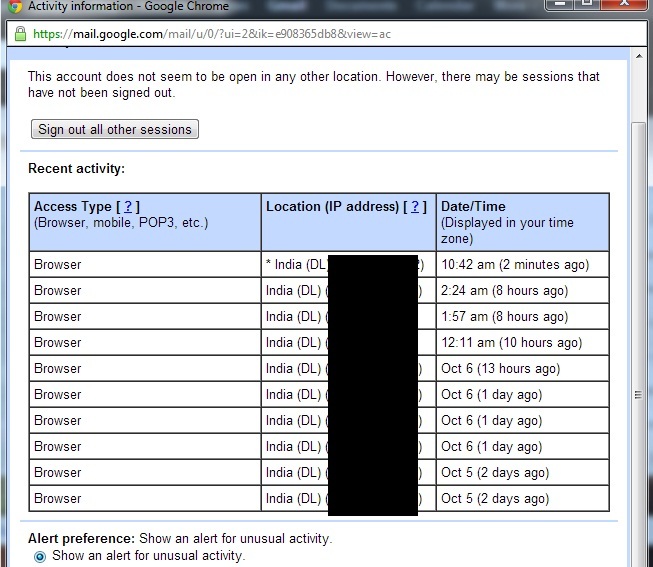 Now you know how to logout of your Gmail account remotely. You must always remember to log out your account in case you are using some friend’s computer or some public computer. It is recommended. Always avoid using work emails on public computers, if there is not an emergency. There are so many risks on public computers. Try to use only trusted computers with safety tips.